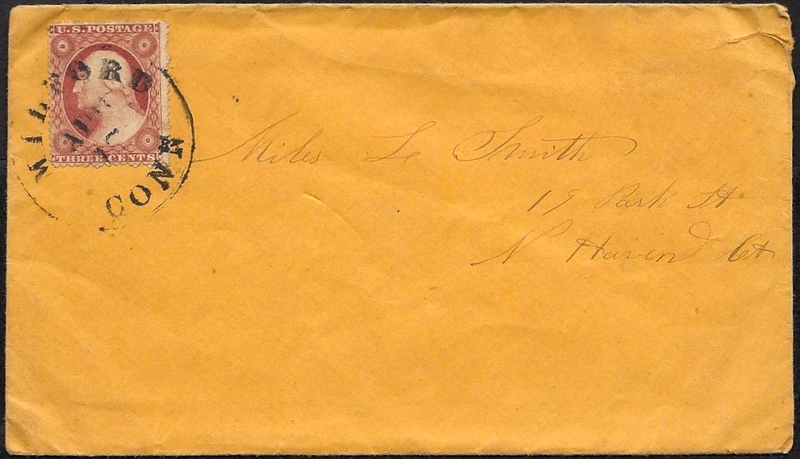 This letter was written by 26 year-old Miles L. Smith (1836–1911) of Company K, 10th Connecticut Infantry, to his parents Lewis Smith (1803–1867) and Abigail Baldwin (1807–1897) of Milford, New Haven County, Connecticut. He refers to his wife, Katie (b. ca. 1843). 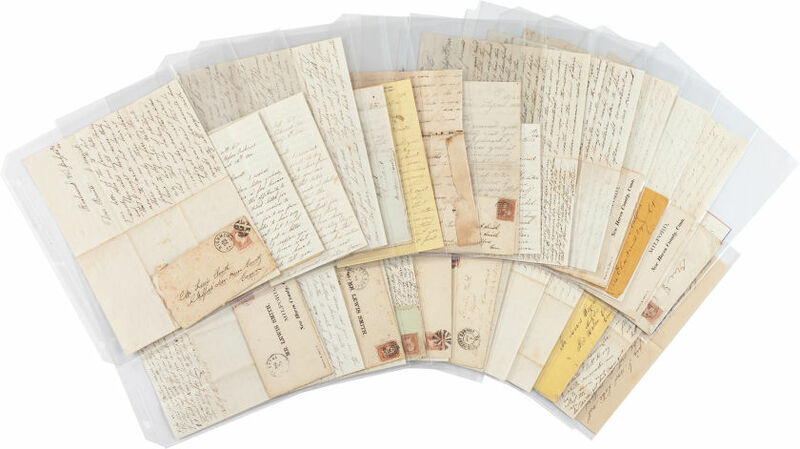 A cache of twenty-six letters dated between February 20, 1862, and July 25, 1865 are for sale on the internet. As the 10th Connecticut marched, camped, and fought along the coasts of Virginia and North and South Carolina, Smith recorded details of his service in the Union Army in letters to his parents, his wife, and brother Herman (who also served in the army). His regiment was active throughout the war and into its final days as they blocked General Lee’s escape from Virginia. They were present when Lee surrendered at Appomattox Court House on April 9, 1865. Hailing from New Haven, Connecticut, Miles enlisted in September 1861 as a private and was mustered into the Connecticut 10th Infantry, Co. “K”. He writes his first letter on February 20, 1862, as his regiment served in General Ambrose Burnside’s North Carolina Expedition. Private Smith describes in gruesome detail in that letter his experience during the Battle of Roanoke Island (February 7-8, 1862), just off the North Carolina mainland: “We have had one battle and took Roanoke Island and 3 thousand Prisoners and one hundred rebel officers and [Virginia] Governor [Henry A.] Wise Son killed him and took over 30 pieces of canon. . . . What a looking set the rebels are all kinds of dress toe pant and coats and old black hats they look just like states prisoners. . . . I tell you it was hard to see the men that was shot some with both legs off and arms shot off and balls through the head and the balls was just as thick as hailstones flying all a round our Colonel was shot dead and our Captain wounded in the head shot off part of his ear.” Later in 1862 he notes the importance of his weapon: “I think my gun is the best friend I have in the field of battle” (September 17, 1862). In his December 7, 1862, letter, Smith writes about eating Thanksgiving dinner as a soldier, though he “should have liked to been there [Connecticut] to enjoyed the Thanksgiving dinner with you and to eat some turkey and pudding and chicking pie and mince pie.” This is noteworthy since President Lincoln made Thanksgiving an official federal holiday in 1863. Smith mustered out go the service in August 1865 as a first sergeant. I now take my pen in hand to answer your kind and welcome letter that I have just received from you at home and how pleased I was to hear from you for it seems a long time since I have heard from you. I think that you had not got the letter that I sent to you for you spoke about sending a receipt for me to sign my name and I did so and wrote a letter the same day I got it and put the receipt in the letter and sent it back to you the same day that I got your letter. You must have got it by this time. We are way down South in Dixie encamped in a cotton field on St. Helena Island. I have seen quite a number of the 6th Connecticut Vols. Saw Mark Bassett. He is tough as a knot and quite a good many that I am acquainted with. You spoke about the 15th Regiment coming down here. I hope they will for I should like to see the boys very much. Most all of the Milford boys have got their discharge. The weather here is fine and hot as July is in the North and the oysters are thick as they can grow. It is quite a curiosity to see the pametto trees and orange trees full of oranges. What do the folks think about the war at the North? I think they will have to come yet before it is ended. Bye and by, some of the regiment’s time will be up and what then they will say? If you want this war to close, why don’t you go and fight like a man for the stars and stripes, and for your country as I have done. You can’t do it at home. There is plenty of young men that because they have got a sick father, they can’t go. Such and such a one ought to go they will say, but can’t go themselves. That shows what their patriotism is. Such is the ones that I would like to see come and do as the rest of us have. My folks think as much of me, I presume, as some others and I think Katie does. She is saving of the money that I send to home. She has put it all in the bank — a hundred dollars or more that I have sent to her. I hope the war will end before long. There is 7 monitors here. They are going to be something done before long to Charleston and Savannah. I am well and tough as a knot. I don’t go with the colors now for you said that you didn’t like to have me and I don’t on your account. Tell [brother] Herman that he is quite a good writer and I shall answer his letter next time for I want this letter to go in this mail and I have not time to write this time. Kiss Eddy for me. Give my love to Henry and family and James and family and all the folks and Uncle also. And take a good part yourselves. Remember me to all. Write soon and all of the news. Direct your letters to Port Royal, S. C., to Co. K, 10th Regt. C. V. You know my name of course. This entry was posted on Saturday, November 1st, 2014 at 5:15 pm	and posted in Uncategorized. You can follow any responses to this entry through the RSS 2.0 feed.